Posts tagged "the welfare queen a myth about black women"
Over the years I have commonly heard people (particularly white people) talk about how black people abuse the welfare system and don’t want to work, but just want to stay home and collect welfare. Oftentimes they talk about the young black mother who has lots of kids from different fathers and keep having babies so they don’t have to work and can just collect the welfare and food stamp money. Many times these same people will talk about how immigrants are taking jobs away from americans (I guess from white americans). Not sure about that one. So I started thinking, when exactly did this myth get started? I did some research and found out that Ronald Reagan first talked about a women who was abusing welfare who lived in the South Side of Chicago. To be fair, he did not coin the term “welfare queen”. While the story about the woman in Chicago was not altogether untrue, although, with her story, Reagan marked millions of America’s poorest people as potential scoundrels and fostered the belief that welfare fraud was a nationwide epidemic that needed to be stamped out. This image of grand and rampant welfare fraud allowed Reagan to sell voters on his cuts to public assistance spending. 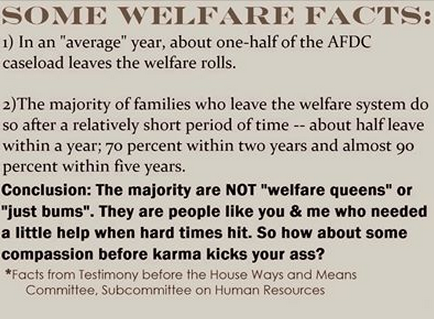 The “welfare queen” became a convenient villain, a woman everyone could hate. She was a lazy black con artist, unashamed of cadging the money that honest folks worked so hard to earn. That term and that idea of black laziness has been perpetuated since then, and sticks with us today. The statistics speak volumes. There are 38% of welfare recipients are white and 39% are black, however, when you compare that with the fact that 77% of this country is white and only 13% are black, that changes the picture. While it is true that 1% more of the welfare recipients are black, there are so many fewer of them, it speaks volumes about oppression and white privilege. Patricia Arquette became a hot topic recently because she addressed wage inequality during her Oscar speech. I won’t even go into the 99% of the things that were wrong with her speech and focus only on the 1% that was right- there is a wage gap between men and women. 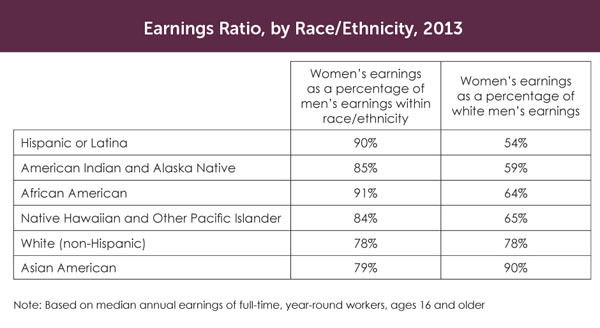 But let’s look deeper into this wage inequity. I found this excellent picture on the American Association of University Women website. I especially love that they compared within race percentages as well as against white men. White men earn the most of anyone in this country, and are the most privileged group of people in our society. So when you look at the fact that black women earn 91% of what black men earn and only 64% of what white men earn is it any wonder that there is 1% more black Americans on public assistance than white women?? I do wish there was one more column, which looked at race and women. In other words it would have been great to see how the racial divide stacks up when comparing just women. How much does a black woman, native american woman, hispanic woman etc. earn when compared to a white woman. Because although white men have the most privilege, white women are number two on the totem pole of hierarchy in this country. So is there really any truth to black people, especially women abusing the welfare system? Or is the problem with the system, in that black women make so much less money, that they have to rely on government assistance to make ends meet?